If you are a Final Cut Pro editor you may agree with us that moving your elements on screen should not be a cumbersome and boring task. You may want to scale your elements, give them a spin, or even throw them accross the screen, and then, grab some attention with a wiggle behavior. Doing THAT should be a painless process! ...but apparently it is NOT! Many editors avoid these tasks just because they need to do lots of keyframing and adjusting parameters in different tabs and so forth, and in some instances you have to jump to a helper application to do what you could be doing right in your editing timeline. SUGARfx MagiMoto brings these tools to your editing timeline with the ease-of-use that you would expect, especially for those moments when you want to have all the control to perform such tasks like throwing (moving) your element across the screen, spinning, scaling, or apply a subtle wiggle behavior in selected directions. MagiMoto is the perfect tool for the job! You have the option to do just one task or make a combination of moves and spins to create unique animations and slide shows of your own, simple, effective and in real time. 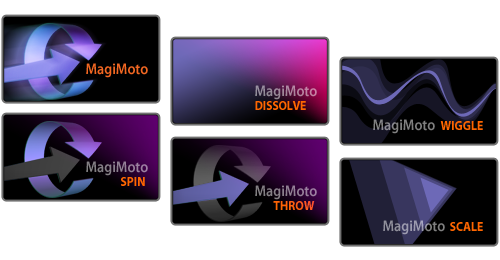 MagiMoto provides a wide range of possibilities besides moving or spinning your video elements anywhere in the screen. 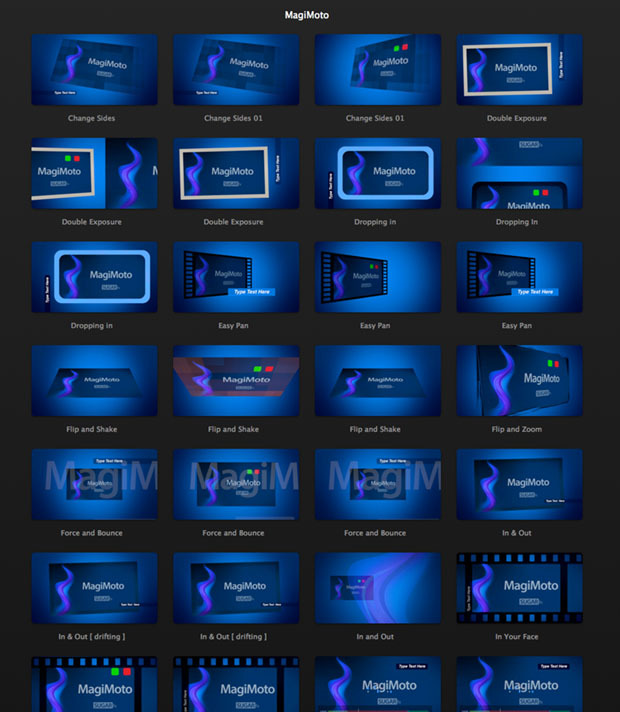 Make your own transitions that have your creative signature, or create unique and interesting slide shows (available on selected host applications), all of that is possible using MagiMoto. Save your setups as presets and share them with your peers. You'll see that the benefits are rewarding and the possibilities are endless. MagiMoto offers on-screen display that interactively responds to your timing configurations, making it easy to understand and animate without the use of keyframes. Final Cut Pro X users. MagiMoto is available in Final Cut Pro X and provides a whole set of filters and titles that can be used as-is or customized to taste.